In lesson 14 of this Dutch course Amsterdam related words are discussed. Amsterdam is the cultural capital of the Netherlands and a very internationally oriented city. Amsterdam is the location of many global head quarters and european head quarters of globablly operating companies. Amsterdam is the city which has the most expats. Many of the foreigners who learn Dutch, live in Amsterdam or end up in Amsterdam. 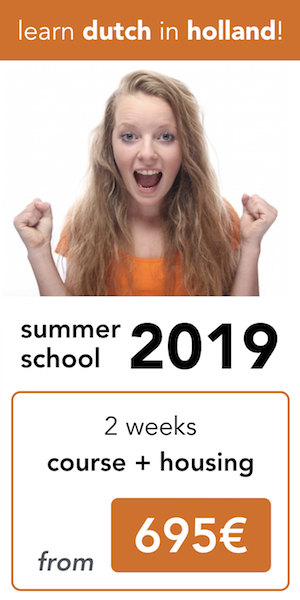 Amsterdam has a lot of Dutch language schools (like our own program: dutchsummerschool.nl) and is therefore one of the best places to go to if you learn Dutch and you want to look further than my website with free content. In the Dutch language, there are quite some typical words which are related to Amsterdam (such as canal house, house boat, coffeeshop). And there are words which you definitely need to know when you come to Amsterdam, for example “pont” which you need to travel between the center and the North of Amsterdam (until the metroline will be opened).